In the day today practice we come across cases of vomiting in toddlers and babies. These are effectively managed by homeopathic medicines. 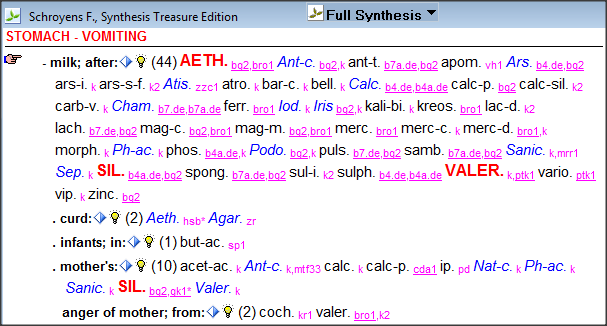 In this rubric there are a lot of remedies: Aethusa, Antimonium crudum and so on. Aethusa is a remedy for children. 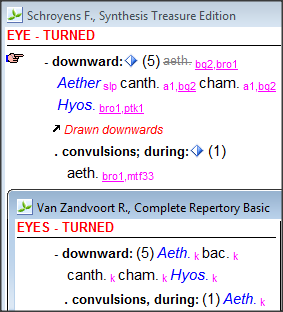 What is the appearance of the vomiting in Aethusa ? Like curdled milk (see repertory). Each time they drink - the milk has already been digested in the stomach, it is curdled, only then they vomit the milk.Aethusa is the best remedy for babies and toddler vomiting curdled milk. the other remedy is Agaricus. They have a very particular outlook. Those children are very thin and they always look downward with their eyes - "eyes turned downward"
When you do not know this symptom you do not pay attention to it. Normally, they also have diarrhoea with undigested food and cramps before stool. After vomiting they are hungry again and start eating. Often they are also very sleepy after vomiting - "sleepiness after vomiting"
the first remedy here is Ipecacuanha. Mostly, Ipecacuanha has vomiting during coughing and "one sided redness, cheek", and a second symptom is a clean tongue during vomiting - "tongue clean during vomiting"
Because of the sickness and vomiting the digestion is disturbed, so normally the tongue is coated. 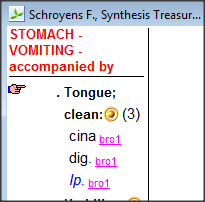 There is another remedy that has a clean tongue during vomiting, that is Cina. In Antimonium crudum you see immediately the white coated tongue. You also find Calcarea in the rubric-"vomiting after milk" along with, Iris, Sepia, Podophyllum, Silicea. Silicea is one of the most important remedies in this vomiting, but you recognize them, when they vomit mother's milk. It is the first remedy, when the mother is breastfeeding, and the child always vomits the mother's milk . But you have to differentiate with other remedies, which are in the rubric "vomiting after mother's milk" : Antimonium crudum, Calcarea, Natrum carbonicum, Phosphoricum acidum, Sanicula, Silicea and Valeriana. Mostly, the Silicea children are premature children. They are very thin and white and also their head is enlarged, their hair is very fine, very fine and dry like hay;but they are not weak children.